Nusantara’s Awak Mas gold project in South Sulawesi is on track to become the Asia-Pacific’s next gold producer after delivering on all the promises made in last year’s float on the Australian Securities Exchange. These include ticking off the key milestones including a Definitive Feasibility Study that confirms a financially robust, long-life asset with strong growth potential. On the back of the DFS and with all regulatory approvals in place for development, we are now progressing financing, both for the planned core mine operation and further exploration of the best potential nearby areas under our exclusive Contract of Work (CoW) with the Indonesian Government. In addition, Nusantara is in discussion with strategic partners to support overall development of the project with production expected in 2021 and an after-tax payback period of 4 years. To enhance the project, our immediate exploration focus is on significant mineralisation within 3km of the proposed processing plant. Announcing delivery of key objectives set in the 2017 IPO – which included increasing the mineral resource, securing a long-term CoW, and completing a DFS – our MD and CEO Mike Spreadborough noted that Nusantara had now identified a 2.0 Moz mineral resource and 1.1 Moz of ore reserves in a highly desirable gold mining region of the world. He said the DFS supported an initial 11-year project producing approximately 100,000 oz per year delivering a post-tax NPV of US$152 million with a 20.3% IRR using a gold price of US$1,250 per ounce. The DFS identified an initial capital cost of US$146 million, pre-production mining expenditure of US$16 million, and project sustaining capital of US$29 million. All-In Sustaining Cost (AISC) was US$758 per ounce. Mike added that on the back of the DFS, discussions with financiers are progressing positively with first gold production targeted for 2021. He said recent exploration had demonstrated the potential of Awak Mas to provide high-grade satellite operations to add to production from the existing deposits. “Our confidence in the exploration model, together with renewed focus on geophysics and the possibility of further and substantial discovery, add enormously to the future long-term viability of the project”. Nusantara’s CoW runs to 2050 with partial divestment, at fair value based on international standard criteria, not required until 10 years after first production. The immediate exploration focus is on exciting prospects within a 3km radius of the proposed processing plant. The program also includes re-processing previously acquired geophysical data, which is demonstrating potential for additional discoveries across the entire CoW. Awak Mas remains one of a few undeveloped gold projects within the Asia-Pacific. Its location is supported by access to low cost grid power and port facilities just 45km away. Sulawesi has a long history of mining and provides ready access for Awak Mas to experienced contractors, services and a skilled workforce for the construction and operation of the mine. Operations will be underpinned by a logistics centre on the coast in Belopa and a support centre in the city of Makassar. Indonesia continues to provide a stable and supportive environment for mining operators with investment grade credit ratings and is highly rated by global mining investors. We are focused on exploring for additional gold mineralisation along the high-potential, under explored 2km corridor between our key Awak Mas deposit and our nearby Salu Bulo deposit in South Sulawesi, Indonesia. Joining the dots between the deposits is a priority as we seek to build the value of the overall project ahead of targeted first production. The fresh exploration focus follows our recent AUD$5m capital raising and earlier positive results from extension drilling into the corridor that found significant gold mineralisation above the average resource grade for the Awak Mas deposit. Our managing director, Mike Spreadborough, updated investors with news that the company has more than 16 high-grade exploration targets, including the main corridor which is close to our planned project processing facility, with an aspirational goal to expand the entire project into a 5Moz gold field. The project currently has an indicated resource of 2Moz. Mike said the overall potential includes the East Corridor from Salu Bulo to Tarra where there are ‘walk-up’ drill targets at Kandeapi and Salu Kombong. There was also greenfield exploration potential on unexplored areas in northern and southern parts of the project area we secured under the Contract of Work we signed with the Indonesian Government. Production at Awak Mas remains targeted to commence in late 2020, with at least a 10 year mine life and initial production of 100,000oz a year using low-cost, open pit mining close to established quality infrastructure. Project approvals are in place for construction. Under the recent CoW, partial divestment requirements at fair value based upon internationally accepted standards were deferred until the 10th year after first production. The CoW gives Nusantara’s Indonesian subsidiary the sole rights to explore and exploit any mineral deposits until 2050, with an extension possible out to 2070. A definitive feasibility study is on track for delivery in coming weeks. Mike added that as well as the excellent potential to grow the mineral resource and ore reserve, the favourable outlook for Awak Mas is being underpinned by the strong and stable mining investment environment in Indonesia and our good relations with the government. Coupled with investment-grade credit ratings from the major ratings agencies, Indonesia has become an increasingly attractive destination for mining investors from around the globe. GDP has more than doubled over the past 10 years and continues to grow at about 5% a year. The New York-based National Resource Governance Institute has ranked Indonesia the 11th most attractive destination for foreign investors of the 81 countries that it surveys. The favourable outlook for our flagship 2Moz Awak Mas gold project in South Sulawesi as we head towards the goal of production is being underpinned by the strong and stable mining investment environment in Indonesia and our good relations with the government. As CEO Mike Spreadborough told a recent investor roadshow, Indonesia now has one of the world’s largest economies. Coupled with investment-grade credit ratings from the major ratings agencies, the country had become an increasingly attractive destination for mining investors from around the globe. Mike noted that Indonesia’s GDP more than doubled over the past 10 years and continues to grow about 5% a year. The New York-based National Resource Governance Institute has ranks Indonesia the 11th most attractive destination for foreign investors of the 81 countries that it surveys. Based on the current mine development schedule, with first production targeted for 2020, this divestment is not anticipated before 2030, although Nusantara may elect to sell any percentage interest beforehand. Mike also told the roadshow that the definitive feasibility study for Awak Mas remains on track for delivery this July. The DFS will focus on Awak Mas becoming a long-life, low-cost, open-pit mine able to take advantage of being close to established infrastructure. The project is just 45km from the coast with good access to roads, two ports, flights, and telecommunications. He outlined DFS targets that include: a mine life of greater than 10 years; production of greater than 100,000 ounces of gold a year; AISC of around US$700 an ounce; and capex for the project of US$150 million to $170 million. Fresh drilling results confirmed Awak Mas’s previously reported 2 Moz mineral resource at a 0.5 g/t of gold cut-off. And 89% of the project is in the indicated resource category, an increase of 0.2Moz from our previous update. This estimate will form the basis of the DFS. Mike said that with significant exploration potential still to be tested, the company expects to continue to grow the quality and scale of the project. The golden potential of Awak Mas is being rapidly realised! A new ownership agreement with the Indonesian Government, continued positive drill results, and strategic board appointments for our 100%-owned Awak Mas gold project have accelerated our flagship project towards the goal of production. After locking in tenure over Awak Mas to 2050, and securing ten years of investment stability after commencement of production, we’re now focusing on releasing our first ore reserve, , which is in South Sulawesi, completing its definitive feasibility study, and financing and developing our planned mine. And recent drill results have lifted our confidence. 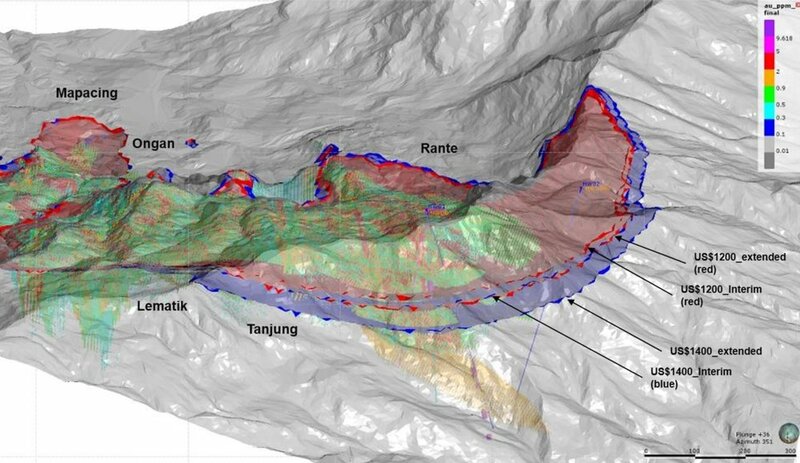 Not only have they confirmed a significant extension to Awak Mas, they also confirmed the potential for more gold in the underexplored 2km corridor between Awak Mas and our Salu Bulo deposit. Together, the 2 deposits already hold 2Moz of gold. Our Managing Director and CEO Mike Spreadborough told the ASX: “These results provide strong evidence of the potential continuation of mineralisation between Awak Mas and Salu Bulo. For the push to devlopment, we’ve appointed a new chairman, Greg Foulis. Greg brings more than 30 years of resource industry experience across senior executive roles as well as business development and investment advisory. Most recently, he was CEO of Kingsgate Consolidated, an ASX-listed gold miner and developer, where he led a business refocus and restructure that also shed over US$100 million of debt. Our former chairman, Martin Pyle, will stay on as a non-executive director. Our senior executive ranks were strengthened earlier this year when Derek Humphry joined us as chief financial officer. In announcing the new Contract of Work agreement, which involved amendments to an existing CoW with the Indonesian Government, Mike said Nusantara’s Indonesian subsidiary had sole rights to explore and exploit any mineral deposits within the CoW area until 2050. After this period, the operations under the CoW may be extended in the form of a special mining business licence which currently allows for an extension of 10 years and a further extension of 10 years. The agreed amendments require the divestment of at least a 51% share in the CoW to Indonesian participants at fair market value according to internationally accepted practice by the 10th year of commercial production. Based on the current mine development schedule, divestment is not anticipated to be required before 2030, although Nusantara may elect to sell any percentage interest before this time. Mike said, “This agreement provides certainty of tenure, investment stability for the development of the Awak Mas gold project and compliance with the prevailing law. The Mineral Resource estimate for our keystone Awak Mas Gold Project has been increased by 12% to more than 1.9 Moz of gold and our MD Mike Spreadborough has expressed growing confidence that the project is on track to produce a strong-yield, long-life mine for shareholders. RANTE-TANJUNG – Oblique View Looking North-North East. Extended Model. Interim (red) and Extended (blue) Model Pit Shells. Earlier this year, Mr Spreadborough announced positive exploration drill results for the eastern extension to the Awak Mas deposit. This followed high grade gold drill results from Awak Mas’s satellite deposit, Salu Bulo. Further drilling at Salu Bulo and the eastern extension are under way. The overall Project in South Sulawesi is 100% owned by Nusantara through a 7th generation Contract of Work with the Indonesian Government. The current total Indicated and Inferred Resource at 0.5 g/t gold cut‐off for the Awak Mas Gold Project (that includes Awak Mas, Salu Bulo and related deposits) now stands at 42.6 Mt at 1.40 g/t gold for 1.93 million contained ounces. Awak Mas’s 1.93 Moz Mineral Resource estimate (US$1,400/oz optimisation shell) is based on the first 25 holes of a 67-hole program. Within a US$1,200/oz optimisation shell, the company has reported a 1.56 Moz Mineral Resource estimate, which is a 71% increase on that reported previously. This highlights the potential for a high resource to reserve conversion ratio for the current definitive feasibility study. Importantly, about 85% of the contained ounces within the Awak Mas deposit and about 80% of the contained ounces for the entire Project now fall in the Indicated Resource category and will be available for incorporation into the coming Ore Reserve estimate. · Awak Mas Lower – the resource definition drilling program is on‐going and an updated Mineral Resource estimate is expected to be completed in April. · The Awak Mas Highwall exploration drilling program is continuing and any results from this program will be incorporated in the Mineral Resource estimate to be released in April. Nusantara’s development strategy is for construction of a large-scale, low-strip-ratio open pit operation with ore to be processed by conventional whole-of-ore cyanide leaching. The Project has environmental approval and is favourably located in non-forestry land close to established roads, ports and grid power. This will enable quick progress toward development when the definitive feasibility study is completed about the middle of this year. Our second strategy is to grow the resource base and sustain a mining operation beyond the initial targeted life of 10 years. Multiple drill-ready targets have already been outlined extending from the three main deposits and in other areas of the 140km2 contract of work. We remain funded with cash reserves of A$9.5 million as at 31 December 2017 and are in preliminary talks with potential strategic Indonesian investors for the development of Awak Mas. Negotiations are also underway with the Indonesian Government on amendments to the Awak Mas contract of work, including fast track into a 33-year operations and production period. Following the expected completion of the definitive feasibility study, an investment decision is planned in the September 2018 quarter. RANTE-TANJUNG – Oblique View Looking North-NorthEast. Extended Model >0.5g/t Au. Tanjung and High Wall Fault Traces (purple).